Biology is full of surprises, and they often tell us important things about ourselves. Crystallography is no exception: often, unexpected things appear once a structure is solved. The recent structure of a bacterial tryptophanyl-tRNA synthetase, solved by researchers at JCSG, revealed two unexpected features. 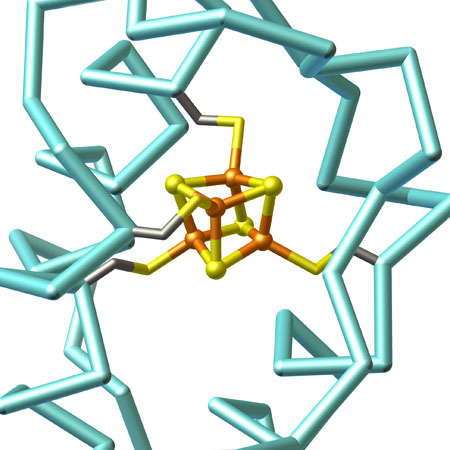 The biggest surprise in the structure, available in PDB entry 2g36, was the discovery of an iron-sulfur cluster. Tryptophanyl-tRNA synthetase is an elongated dimeric enzyme, with the tryptophan-adding machinery at near the center, and the tRNA-recognizing elements at the two ends. The active site is very similar to the enzymes from other organisms, but the tRNA-recognizing portion is built around four cysteines, which together trap an iron-sulfur cluster. A second surprise occurred in the active site: the crystals include a molecule of tryptophan bound in each subunit of the enzyme. This came as a surprise, since tryptophan was not added to the mixture of molecules used to crystallize the enzyme. So, these tryptophan molecules must have hitchhiked along with the enzyme through the entire process of expression and purification, ultimately showing up in the electron density map. This is a reflection of the tight binding and specificity of the active site for tryptophan, which is essential for its function in adding the proper amino acid to its target tRNA. The presence of tryptophan in the structure is easily explained, but why is there an iron-sulfur cluster? This is the first time that an iron-sulfur cluster has been seen in aminoacyl-tRNA synthetases, but after searching through genomic sequences, a similar four-cysteine motif was found in a variety of other species. Also, given that iron-sulfur clusters are rather expensive to construct, we might guess that it's playing an important functional role. Researchers at PSI have hypothesized that the cluster may be needed to recognize the particular modifications of the tRNA, but a definitive answer will have to wait until these tRNA modifications are fully characterized. To learn more about the protein or make a comment about the possible role of the iron-sulfur cluster, take a look at the page at TOPSAN. Two structures of tryptophanyl-tRNA synthetase are overlapped here. The enzyme from Thermotoga maritima was crystallized with tryptophan, and the human enzyme was crystallized with tryptophan and tRNA. Presumably, the tRNA binds similarly in the Thermotoga enzyme. Notice that the anticodon of the tRNA (colored magenta) is predicted to bind closely to the iron-sulfur cluster (colored yellow) in the Thermotoga enzyme. Use the buttons to display the two forms of the enzyme, the tryptophan, and the tRNA. Han, G. W. et al. Structure of a tryptophanyl-tRNA synthetase containing an iron-sulfur cluster. Acta Cryst. F66, 1326-1334 (2010). Shen, N., Guo, L., Jin, Y. & Ding, J. Structure of human tryptophanyl-tRNA synthetase in complex with tRNAtrp reveals the molecular basis of tRNA recognition and specificity. Nucl. Acids Res. 34, 3246-3258 (2006).